John Dryden once said, "We first make our habits, then our habits make us." Now that the school year is underway, it's a good time to rethink your personal habits and patterns, and perhaps make some adjustments. We've all heard the Biblical saying, "You reap what you sow." In other words, what you're doing today will have an impact on your future self. Everyday we are consciously (and unconsciously) planting seeds of a sort. Our seeds germinate. Most people do not live intentionally, with a purpose. Consequently they're operating in a less-than-conscious manner. Unless we are consciously forming good habits, we are unconsciously forming bad ones. What habits are you forming today -- right now? Have you noticed how easy it is to be lazy? It's easy to sit on the couch and watch re-runs of The Office. It's easy to browse Facebook until you look up and notice that four hours has passed and you missed class, lunch, and study time (and a shower). 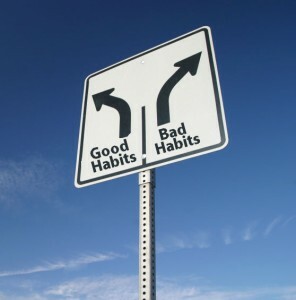 Forming bad habits takes little conscious effort or intent. Here's another pithy adage. There are three types of people in the world: those who make things happen, those who watch things happen, and those who ask, "What happened?" Lots of people end up in the final category. Many Americans pass their waking hours with simple amusements; most with their best friend: the TV. The root meaning of "muse" means "to think", so "amusement" is non-thinking. A lack of thinking. Eng's principle states: The easier it is to do, the harder it is to change. Forming good habits takes a bit of discipline. It takes effort. It takes energy. It takes focus. NOTE: I'm not suggesting we all become puritanical workaholics, using every minute with relentless purpose. There's a time and a season for everything under the sun. Leisure time is fine. Facebook is fine. Your occasional downtime is a healthy thing. So, what habits are you forming today? What's a small new habit you can try -- and repeat? It may be eating smaller portions, using less salt, smiling more, expressing your feelings more. It could be an exercise habit -- even walking around the block once a day. At work, it could be setting higher goals or communicating better with your co-workers. Keep it simple, believable, and do-able. Pick a few pain points and take baby steps. Forming a new habit involves taking small daily actions -- done on a schedule. You cannot skip spring planting if you want a fall harvest. Recreating your life doesn't take a lot of work -- just repeat a single positive action on a daily basis for 21 days in a row. That's how long it takes to form a habit. Then add another small one. The force of good habits will automatically generate your power and good fortune. Avoid letting life just happen to you. Don't get older and ask yourself, "What happened?" We all know the pain of discipline is far less than the pain of regret. Decide today to try on a new small habit and follow through with it for 21 days in a row. Share your success stories with others! They're inspiring.